In the teal blue shallow waters behind the reefs of the Caribbean Sea, green turtlegrass waves gently in the ocean currents. The flowing lace patterning and yarn colors used on these socks match the view I have from the deck of my sailboat anchored in the islands. The easy lace patterning uses only yarn-over, ssk and k2tog and is only worked once every 4 rounds. 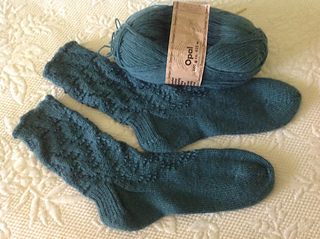 The other 3 rounds are blissfully simple knitting. The patterning tapers off asymmetrically on the instep to plain stockinette for a comfortable fit in your shoes. The heel construction is the traditional flap & gusset method. Instructions are given both in charts and written Line-by-Line.